The Triangle return of Disney’s NEWSIES opens tomorrow, Tuesday, August 16 at DPAC for a limited engagement through Sunday, August 21. 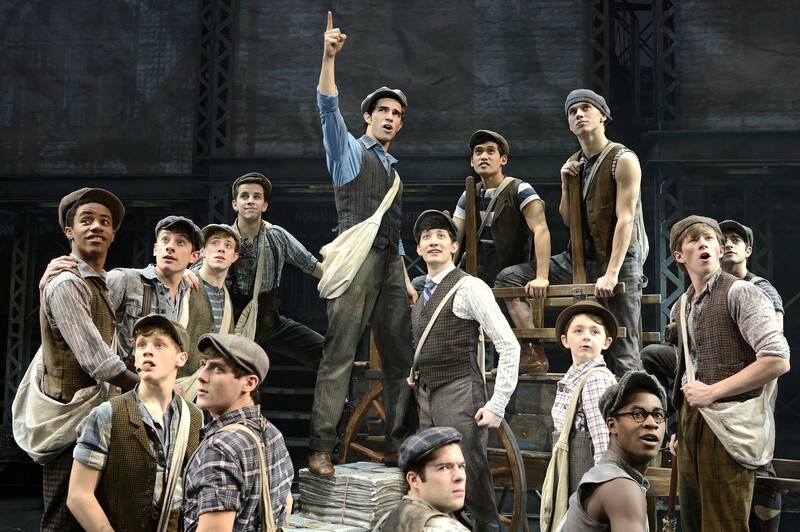 Set in New York City at the turn of the century, NEWSIES is inspired by the real-life ‘Newsboy Strike of 1899,’. It tells the rousing tale of Jack Kelly, a charismatic newsboy and leader of a ragged band of teenaged ‘newsies,’ who dreams only of a better life far from the hardship of the streets. But when publishing titans Joseph Pulitzer and William Randolph Hearst raise distribution prices at the newsboys’ expense, Jack finds a cause to fight for and rallies newsies from across the city to strike for what’s right. I’ve never seen the theaterical release or stage production so I am really looking forward to attending the show this week and will share my full review Wednesday. Leading up to its run in Durham, I had the honor of interviewing Joey Barreiro who plays the central character Jack Kelly who joined the production this past October. When did you get the call that you landed the role of Jack Kelly? I was working as a music director for a show in upstate New York when I got the call. I’ve been in other productions like A Chorus Line and Into the Woods, but this is my first as a lead. It’s very exciting! What is it like dealing with physical aspects of performing the show night after night? The set is essentially three metal towers that move around the stage. The cast spends much of the show performing while running up and down the three levels of each tower. It is quite a workout. I burn a lot of calories and need to make sure I replenish them between performances. There is a lot of dancing in Newsies. Are you a trained dancer? Not at all! I studied music in school. I actually don’t do a lot of dancing in the show, but I’m surrounded by an incredible cast of talented dancers that put on an amazing performance throughout the show. What are some things to look for in this latest production? There are so many great numbers, but one that really stands out is “Seize the Day” in Act I where the character of Crutchie is attacked during protest and taken away. Also “Watch What Happens” that helps portray the development of Jack’s character and his journey as he weighs the risks of trying to get Crutchie back. I understand Newsies has a bit of a cult following and a passionate fanbase. What is that like? It’s a bit surreal, but awesome. When I first landed the role I was pulled aside and told what to expect. The fans are great and it is amazing them at each show. Anything you are looking forward to doing while in Durham? I really enjoy checking out museums in each city the tour visits. Maybe a library too and of course being a music guy I hope to catch some local jazz music. Newsies plays at the Durham Performing Arts Center Tuesday August 16th through Sunday August 21st. For more information and to order tickets visit http://www.dpacnc.com/events/detail/newsies-1.